UFW or Uncomplicated Firewall is an application to manage an iptables based firewall on Ubuntu. UFW is the default firewall configuration tool for Ubuntu Linux and provides a user-friendly way to configure the firewall, the UFW command is just like English language so the commands are easy to remember. The UFW firewall supports IPv4 and IPv6. UFW provides also a GUI application, if you use a GNOME desktop you can install gufw, or if you use a KDE desktop you can install kcm-ufw. The Basic UFW Command Syntax. 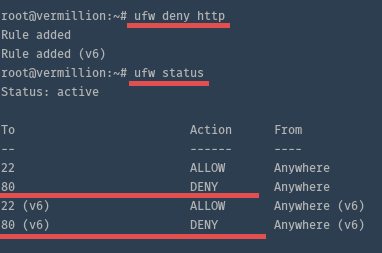 The UFW Allow and Deny Command. Deleting a rule in UFW. UFW will deny all incoming connections after you turn it on. So the first thing you should do is to allow SSH access for the server if you like to manage the system remotely. 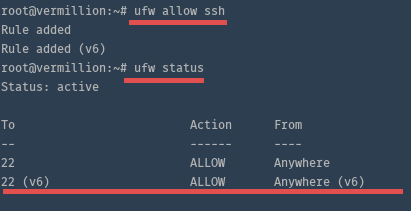 The command "ufw allow sshport" allow access by SSH, replace SSHPORT with the port of the SSH service, the default SSH port is 22. If you like to allow incoming connections on port 22 for TCP only, add at the end of command "/tcp" like shown in the following example. When the service that you want to allow access to is listening on its default port, then you can use the service name instead of the port number. This makes it easier to open the port as you might not know the port. UFW will look up the correct port number in /etc/services then for you. Now we will dig deeper into the UFW command syntax, learn how to allow part ranges (e.g. for the FTP passive ports and how to allow access from one IP or subnet only. You can allow a range of ports in UFW. Some services like FTP or IRC use a range of ports to communicate with its clients. The command will allow connections to ports 6660-6670 via TCP and UDP protocol. If you like to allow access to one port from a specific IP only, you can combine the UFW commands that we learned above. 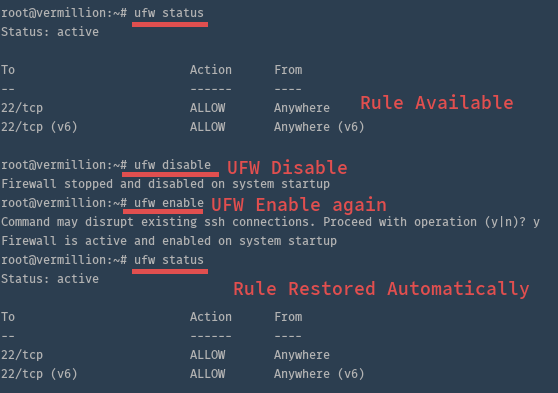 In this section you will learn how to Delete a rule that is saved in UFW. You can use the "delete" command for deleting the ufw rule. Please type the command "ufw delete" and followed by the option that you want to be deleted, allow or deny. That command will delete the rule "allow ssh". be careful, don't lock yourself out of the server. UFW (Uncomplicated Firewall) is the default firewall configuration tool in Ubuntu. UFW commands are similar to English language, this makes them easy to use and remember. This UFW tutorial is a guide to get started with this nice firewall tool if you want to know more about UFW, you can go to the ubuntu wiki or ufw-manpage. While I execute the shell command "ufw status" - I am getting below error message. ERROR: problem running iptables: iptables v1.6.0: can't initialize iptables table `filter': Permission denied (you must be root)Perhaps iptables or your kernel needs to be upgraded. Ensure to run the command as root user or with sudo. If this is a virtual server, then it might be that the virtualization software does not allow it to run iptables. When allowing access to a particular port, the command syntax is, "... to any port N" where N is the port number. Why is the word "any" required? I find it very confusing. We're only allowing access to a specified port, not "any" port.